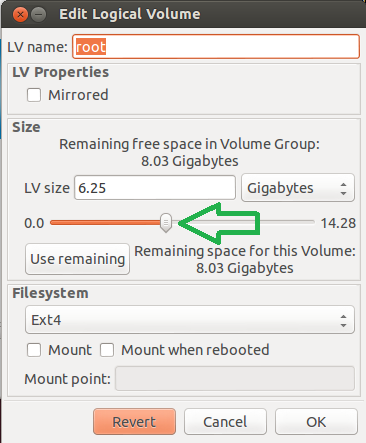 I want to shrink my second (LVM) partition, in order to create a new partition in the newly freed space. I am using the Live CD to do so, because I know I can't resize/move this partition while it is in use. When I opened GParted in the Live CD, I realized that I could not resize the partition, because when I right-click it, the option "resize/move" is disabled. I tried to unmount it, to "lazy" unmount it (umount -l /dev/sda2) but it didn't work. (optional) Remove a physical drive from the volume group if desired (if you now have an unused drive). All credit goes to brianmcgee. Note: vgreduce will fail with cannot resize to xxxxx extents as later ones are allocated if you have another lv at the end of the disk - I had a swap lv, which I deleted. 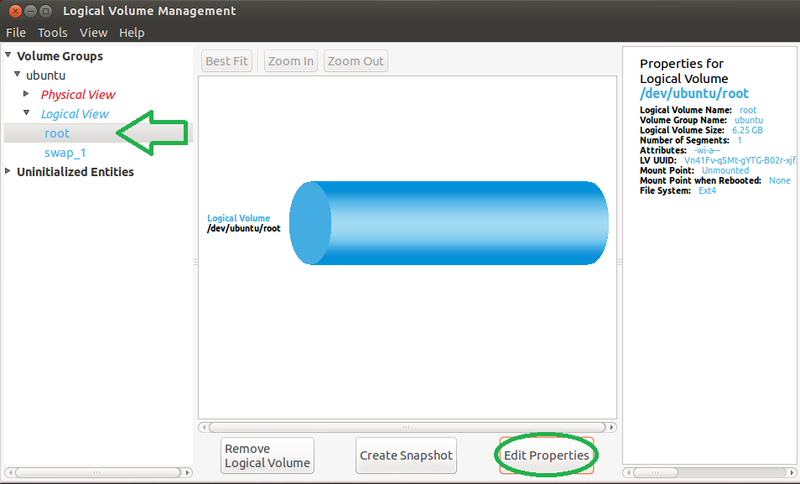 See How to shrink Ubuntu LVM logical and physical volumes? for help on that situation. Once it is installed, run the program, select the logical volume you want to change in the left panel, click 'Edit Properties'. Now change the parameters as you wish! One good thing about system-config-lvm is that it won't allow you to go ahead if the new partition size is smaller than all your existing data combined (I've just tried this and seen for myself). How-To Geek tutorial (this is the origin of the images). Red Hat's complete guide for the program. Note: You should run almost all of the following commands using a Live CD. Sometimes, it wants you to unmount the partition that already mounted on / (in this case, you cannot unmount it). /dev/sda5: cannot resize to xxxxx extents as later ones are allocated. I would recommend another GUI tool - KVPM. It combines functionality of GParted and system-config-lvm. Moreover, it allows some operations on live (mounted) partitions that system-config-lvm doesn't allow However, the volume has to be unmounted for shrinking. Only the latest version of Gparted (0.14) supports resizing LVM physical volumes. The version that ships with Ubuntu 12.10 or 13.04 does not support it. If the volume group associated with the LVM physical volume does not have enough unallocated space, you'll need to make some by shrinking a logical volume. Look at bigbadonk420's answer for instructions on how to do that. You can also use GNOME Disks (included with Ubuntu) for some of the steps if you prefer a GUI. Burn the latest .iso image from GParted's website, and burn it on a CD or put it on a USB stick. Boot from the CD or the USB stick. Alternatively, you could compile the latest version of GParted from source. Use GParted to resize the LVM physical volume. GParted won't let you shrink the LVM physical volume to a size smaller than what the unallocated space allows. I found this answer by accident, but this worked for me at least. In my case I had already a reserved unallocated disk space after the root, so I skip the part how you get more space and just explain how I used it on root without booting. NOTE: Instead of using gparted, you are probably better off using system-config-lvm. Next time I would use that one instead... My gparted version was 0.18. First I used gparted to extend root partition as much as I could. To my surprise it extended only the physical sizes and did nothing to the logical part. So df -k command said that the disk was full still. lvresize -l +100%FREE /dev/ubuntu-vg/root extends the logical partition as far as it can. No need to check and calculate GBs or blocks in various methods. resize2fs /dev/ubuntu-vg/root is then the third step I did: it extends the file system to the size of the logical partition. Note the -r which reduces the file system simultaneously and is safe. To do that using GParted, right click on dev/sda2 (that you want to shrink). Select 'Deactivate'. Now you'll be able to resize your lvm partition. Not the answer you're looking for? Browse other questions tagged partitioning gparted lvm or ask your own question. How can I decrease size of my Ubuntu partition? How to extend partition with unallocated space? How to shrink Ubuntu LVM logical and physical volumes? Can an LVM PV be shrunk at the beginning?